Our clients who lived in a small townhouse East of Hertfordshire and worked busily in London. We were approached for a full project managed interior design service. The brief - glamour and glitz; putting on a show with high end materials and products. Our client’s requested luxury modern style with lots of metallic and reflective surfaces. All the elements you would expect from a luxury interior. We had a certain amount or free rein with this project. The only stipulation was to retain curtains and blinds which quickly pointed the colour palette towards plums silver and charcoal tones. 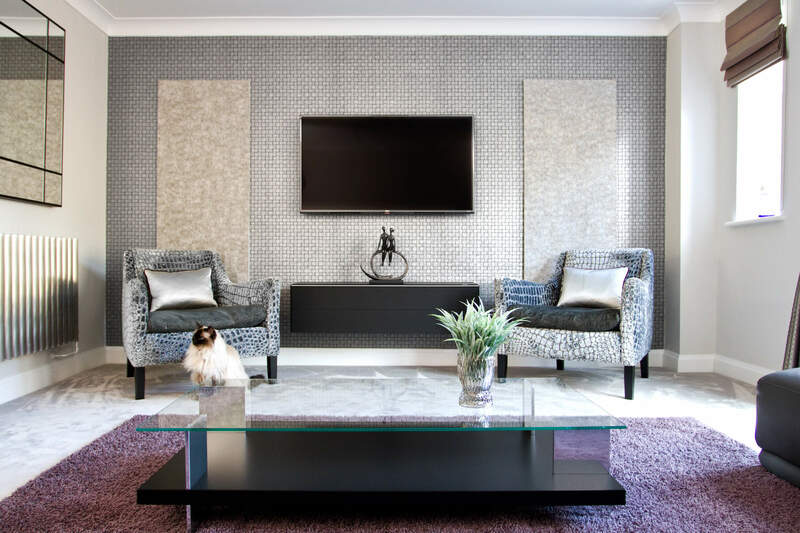 We chose full luxury pile carpet, commissioned from Sandringham Carpets, London, bespoke designer occasional chairs from Designers Guild, and floating media cabinet in matt black from Spectral. Glass topped coffee table from Houseology, and wallpaper panels from Anthology. Every last detail thought of with stainless steel radiator ‘Ellipsis” from The Radiator Company and glitzy fabrics from Zinc Textiles and Romo.